Google breaks the traditional rules of branding by changing its logo everyday. Doritos handed over the US premium advertising slot in the Superbowl to a couple of amateur filmmakers. The software industry is well used to 'living a life in beta.' Even Pope Benedict XVI has embraced the inclusive, 'Obama model' of communication with YouTube broadcasts in 27 languages in an attempt to encourage debate. If the Pope can do loose, anyone can.Loose thinking is at odds with all but the most progressive organizations. Businesses pay lip service to customer collaboration while still exerting maximum control. As Clay Shirky suggests, companies that create products, services and message that are too perfect will leave the consumer thinking 'where is the space for me?' 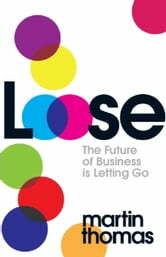 LOOSE shakes up the status quo and shows how prevailing business wisdom needs to change.